12/24 Volt DC Positive Logic Output - 2 Amp, 8 Point IC693MDL730 The 12/24 volt DC Positive Logic 2 Amp Output module for the Series 90-30 Programmable Logic Controller provides 8 output points in one group with a common power input terminal. This output module is designed to have positive logic characteristics in that it sources current to the loads from the user common or positive power bus. The output device is connected between the negative power bus and the module output. The output characteristics are compatible with a wide range of user-supplied load devices, such as: motor starters, solenoids, and indicators. Power to operate the field devices must come from an external power supply supplied by the user. LED indicators which provide the ON/OFF status of each point are located at the top of the module. This LED block has two horizontal rows with eight green LEDs in each row. This module uses the top row labeled A1 through 8 (points 1 through 8). A red LED (labeled F ) on the right and centered between the two rows of green LEDs functions as a blown fuse indicator; it turns ON when any fuse is blown. The module has two 5 Amp fuses with each fuse protecting four outputs; the first fuse protects A1 - A4, the second fuse protects A5 - A8. The fuses are electrically connected to the same common. An insert goes between the inside and outside surface of the hinged door. The surface towards the inside of the module (when the hinged door is closed) has circuit wiring information, and circuit identification information can be recorded on the outside surface. 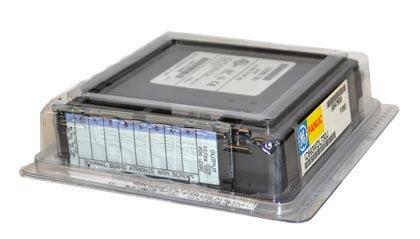 The outside left edge of the insert is color-coded blue to indicate a low-voltage module. This module can be installed in any I/O slot of a 5 or 10-slot baseplate in a Series 90-30 PLC system. Table 7-7. Specifications for IC693MDL730 Rated Voltage 12/24 volts DC Output Voltage Range 12 to 24 volts DC (+20%, 15%) Outputs per Module 8 (one group of eight outputs) Isolation 1500 volts between field side and logic side Output Current 2 amps maximum per point 2 amps maximum per fuse at 60 C (140 F) 4 amps maximum per fuse at 50 C (122 F) Output Characteristics Inrush Current 9.4 amps for 10 ms Output Voltage Drop 1.2 volts maximum Off-state Leakage 1 mA maximum On Response Time 2 ms maximum Off Response Time 2 ms maximum Power Consumption 55 mA (all outputs on) from 5 volt bus on backplane Maximum load current is dependent upon ambient temperature as shown in graph on next page. Refer to Appendix B for product standards and general specifications. Discrete Output Modules 7 GFK-0898F Chapter 7 Discrete Output Modules 7-13 IC693MDL730 Output Module Field Wiring Information The following figure provides wiring information for connecting user supplied load devices and power source to the 12/24 volt DC positive logic 2 amp output module. TERMINALS FIELD WIRING 1 3 5 7 9 11 13 15 17 19 4 8 10 14 16 18 20 12 2 6 a43097 A1 A2 A3 A6 A7 A8 A5 A4 + MODULE CIRCUITRY 1 f OTHER CIRCUITS 5A 5A Fuse for Outputs A1 A4 Fuse for Outputs A5 A8 OTHER CIRCUITS OTHER CIRCUITS Figure 7-10. IC693MDL730 Output Module Field Wiring 10 C 20 C 30 C 50 C 60 C TOTAL MODULE LOAD CURRENT AMBIENT TEMPERATURE ( C) a43836 2A PER POINT 40 C 4 AMPS 1A PER POINT 8 6 4 2 (AMPS) Figure 7-11. Load Current vs. Temperature for IC693MDL730 7 7-14 Series 90-30 PLC I/O Module Specifications July 2000 GFK-0898F Installing and Removing IC693MDL730 Terminal Boards with Holding Screws Discrete output modules IC693MDL730F (and later versions) and IC693MDL731F (and later versions) have a special terminal board that is equipped with holding screws, as shown in the figure below. These screws prevent the terminal board-to-module connections from deteriorating in applications where the PLC is subjected to severe vibration .